The RND 105: a very large, eight-cylinder marine engine. Operating cycle – 2-stroke; bore – 1,050mm; stroke – 1,800mm; cylinder groupings – eight, in-line; brake-horsepower/cylinder – 4,000; engine speed – 108 revs/min; engine weight – 1,175 tonnes; thermal efficiency – 41.5%; mechanical efficiency – 91%. 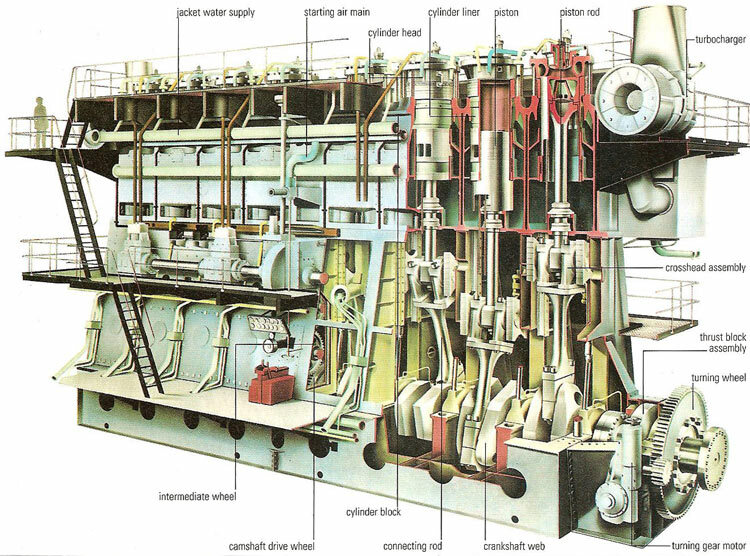 A marine engine is a power plant used to propel sea-going ships, and as auxiliaries in smaller sailing vessels. In the nineteenth and early twentieth centuries, marine engines were coal-fired, piston-driven steam engines. Today, large steam engines are still used, but these are usually oil-fired steam turbine engines; steam, raised in a boiler, spins a turbine, which is geared down to turn propeller shafts. Small, medium, and large diesel engines, and small gasoline engines (including outboard motors) are also in general use. A few ships, notably certain ice-breakers and submarines, are fitted with nuclear engines in which steam for turbines is raised by heat from a nuclear reactor. The engine illustrated here is one of the RND series, designed to meet the high power requirements of large tankers, bulk carriers, and container ships. The RND 105 shown was first installed in 1968 into Japanese-built container ships.